Once you’ve created the behaviour, apply it to a test project so you can test it works as expected. Then apply it to a real project. Be sure to read through the behavior limitations before using a behavior or if you’re having problems getting your behavior to work. This simple example can be used as a tutorial. Further worked examples can be found in the Recipes section - Behaviours Examples. To create a new Behaviour. Go to the Administration screen, and click the Behaviours link in the Behaviours section, or press gg or . and type Behaviours. This is a very simple configuration and should be used to check everything is working. 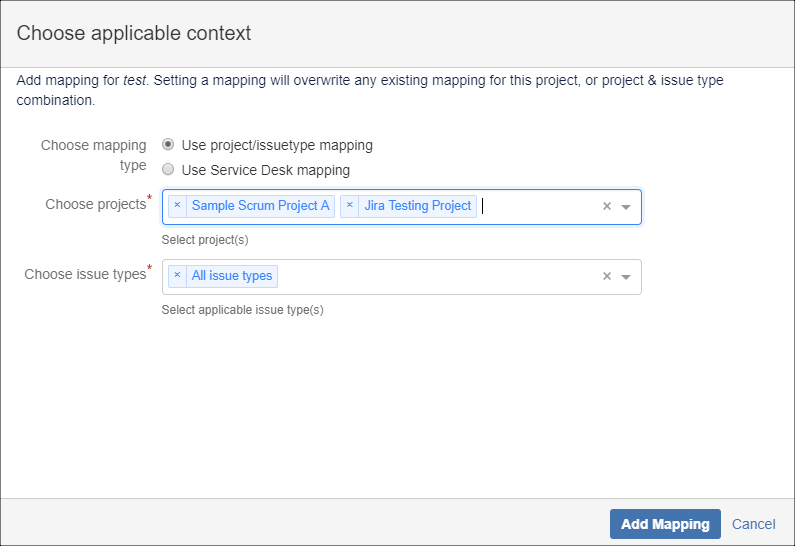 For information about Jira Service Desk mappings, see this page. Create a new issue in the project that you have associated with this behaviour. You should see the default description. (If it doesn’t, see trouble-shooting below). A common scenario is that, when you mark an issue as resolved with the resolution of Fixed, you want the developer to specify the Fix Version. However, it doesn’t make sense to require a fix version when the resolution is Won’t Fix. We solve that by using a server-side validator to mark the fix versions field as required, but only when the resolution is Fixed. Create a new behaviour, or edit your current sample one. Click Add Field, and add the Resolution field. Our server-side script, when written, will be called the first time this field appears, and any time the user changes it in the dialog. This example sets the fix versions field to required and shown if the resolution is Fixed, and to optional and hidden if the resolution is anything else. A good experiment now would be to modify the script so that instead of hiding the field it’s made read-only. To do, change setHidden to setReadOnly. 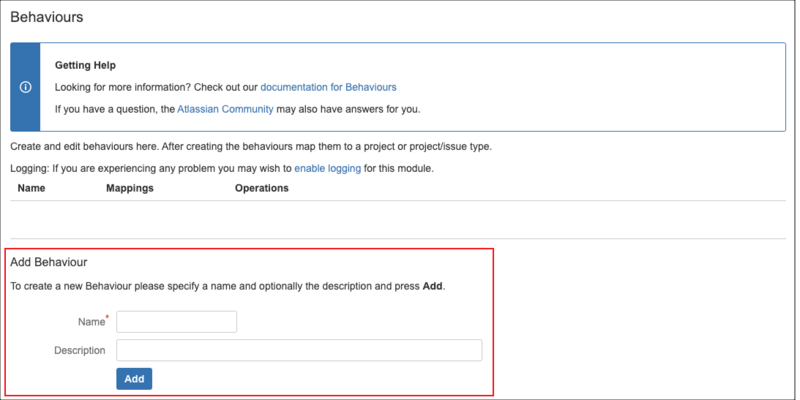 If you have created a new behaviour do not forget to map it to a project, or project/issue type combination. Using an inline script can be painful as you have to keep clicking buttons and saving. It’s more productive to point to a file, then you can just modify that. It will be reloaded automatically. Note that if you have a groovy script as opposed to a class, as in the previous examples, the method name should be run. When configured like this you can modify your code without even leaving the Resolve Issue dialog, let alone doing a page refresh. The path to the script can be relative to a script root. Currently there is no automated way of migrating behaviours. There are some REST APIs that you can use that will help migrating the configuration, although care must be taken. The following REST API provides the mapping between behaviours, and projects/issue types. where 2 is the ID of one of the behaviours above. As you can see, custom fields are identified by their ID. If you are translating this to another system you will need to check and update any custom field IDs that don’t match. If your dev environment is a copy of your production environment you should be fine. Likewise, project and issue types are represented by the IDs and might need updating. where b1.xml is the contents of the behaviour configuration, and admin:admin is an admin username and password. If a behaviour already exists with this ID the command above will overwrite it. where bh.xml contains the mappings retrieved in Step 1. This will overwrite any mappings already defined. Make sure you test the procedure on a non-production instance first. Please check the documentation for curl for the system you are on. We are not able to support you in this procedure. Enable logging (see below) and check the logs. If a behaviour makes a field read-only, the issue history can also reveal if that rule has been subverted. Another side effect is that Behaviours can’t override other server-side validation rules, such as field configurations and workflow validators. For example, if you have a field configuration that specifies a field is required, a behaviour can’t really remove that requirement. You can do the opposite, however, and take a non-required field and make it required from the client’s perspective. No support for bulk edits, at the moment. This could be added, however, all issues part of the bulk edit would need to have the same behaviour associated for it to be doable. The field behaviours are retrieved from the server after the form has loaded in the browser. In my environment this takes approximately 80 ms so is not noticeable by humans. Over the public internet this may be a lot worse, and so the delay in the styling being applied may be appreciable for the users. It is possible to apply multiple behaviours in overlapping contexts. For example, you may have a behaviour that is mapped to one project and all issue types, then another behaviour that is mapped to all projects and one particular issue type. Normally, this is fine. All applicable behaviours are applied in any given context. However, if both behaviours try to manipulate the same field, it’s possible for them to contradict each other. For example, if one behaviour tries to set the field to be read-only, but the other sets the field to be writeable, only one can win. If both behaviours set the field’s value to something specific, only one will be applied. If a behaviour appears to be working inconsistently, this is a likely cause. It may be helpful in these circumstances to use one server-side behaviour for that field. You can map it to every applicable context, then provide some detailed logic specifying in one place what ought to happen in which circumstances. See Scripted Conditions for some sample code that you can re-purpose inside a behaviour. Behaviours function on the Create Issue, Update/Edit Issue, Assign Issue, and Workflow Transition screens. On the View Issue screen, trying to edit a field with a behaviour will launch the edit issue screen, instead of the normal inline editor. Behaviours will not work on the Move Issue screen. They also do not work for any bulk issue operations or any issue edits that bypass the UI such as the REST API and other ScriptRunner scripts. server logs. You can switch these on by using the enable logging link from the Behaviours Admin screen. For the problematic behaviour, click Edit, and include the XML snippet you see there. Description of any custom field types involved, eg their type.